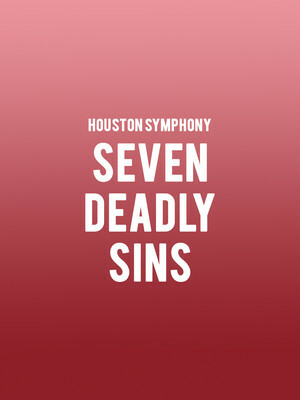 Why See Houston Symphony - Seven Deadly Sins? Join the Houston Symphony and songstress Storm Large for a sultry sonic ride through the sin-soaked streets of seven American cities in this brand new adaptation of Kurt Weill and Bertolt Brecht's 1933 satirical ballet chante The Seven Deadly Sins. Large has received much critical praise for her portrayal of two sisters Anna I and Anna II, and their surreal moral tug-of-war interwoven with the song and dance artistry of the cabaret era. Both Annas reflect two sides of the same person, Anna I is a practical yet cynical impresario whilst the impulsive, artistic Anna II is ruled by her emotions. Setting out from Louisiana with nothing more than their suitcases, the sisters embark on a seven-year journey across America to find fame and fortune. Yet the provocative odyssey them face to face with each of the seven deadly sins, one for each of the cities they visit. Sound good to you? Share this page on social media and let your friends know about Houston Symphony - Seven Deadly Sins at Jones Hall for the Performing Arts. Please note: The term Jones Hall for the Performing Arts and/or Houston Symphony - Seven Deadly Sins as well as all associated graphics, logos, and/or other trademarks, tradenames or copyrights are the property of the Jones Hall for the Performing Arts and/or Houston Symphony - Seven Deadly Sins and are used herein for factual descriptive purposes only. We are in no way associated with or authorized by the Jones Hall for the Performing Arts and/or Houston Symphony - Seven Deadly Sins and neither that entity nor any of its affiliates have licensed or endorsed us to sell tickets, goods and or services in conjunction with their events.